So I'm a big Harry Potter fan and have read all of J.K. Rowling's books therein. I've also recently visited J.K. Rowling's blog where she has posted a rant about fat stereotyping and thinness. "satirises the talking toothpicks held up to girls as role models". "I've got two daughters who will have to make their way in this skinny-obsessed world, and it worries me, because I don't want them to be empty-headed, self-obsessed, emaciated clones; I'd rather they were independent, interesting, idealistic, kind, opinionated, original, funny – a thousand things, before 'thin'." So basically J.K.'s rant places her vehemently against the use of the word "fat" as an insult, and clearly demonstrates her willingness to wield the word "thin" as one with "thin" for her denoting empty-headedness, self-obsession, lack of originality and dullness. Hypocritical behaviour all by itself, for if you are against the notion of using excess weight as an insult it should follow that you'd be against using lack of weight as an insult too. All the more hypocritical though for the author of the Harry Potter series to complain about fat stereotyping as throughout her series she milked those same "strange and sick" fat insults for all they were worth in her portrayal of Dudley Dursley, Harry's fat cousin and muggle nemesis. So what fat insults does she cultivate in her books? That fat people are lazy, stupid, gluttonous, angry, will-less, pigs. 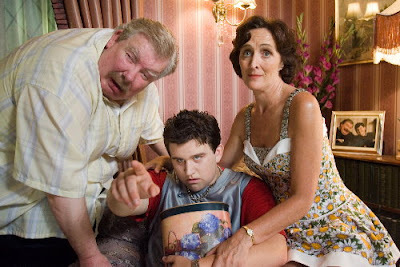 "Dudley looked a lot like Uncle Vernon. He had a large, pink face, not much neck, small watery blue eyes and thick, blond hair that lay smoothly on his thick, fat head....Harry often said that Dudley looked like a pig in a wig." "Aunt Petunia obviously scented danger too, because she said quickly, 'And we'll buy you another two presents while we're out today. How's that popkin?' Two more presents. Is that all right?' Dudley thought for a moment. It looked like hard work. Finally he said slowly, 'So I'll have thirty... thirty...' 'Thirty-nine, sweetums,' said Aunt Petunia. 'Oh.' Dudley sat down heavily and grabbed the nearest parcel." "Dudley looked furious and sulky, and somehow seemed to be taking up even more space than usual." "Dudley had reached roughly the size and weight of a young killer whale"
"Dudley who had already finished his own grapefruit quarter was eyeing Harry's with a very sour look in his piggly little eyes"
"Dudley was dancing on the spot with his hands clasped over his fat bottom, howling in pain. When he turned his back on them, Harry saw a curly pig's tail poking through a hole in his trousers....Meant ter turn him into a pig, but I suppose he was so much like a pig anyway there wasn't much left ter do." J.K., I love your books, and agree with your rant that society is far too quick to judge on the basis of weight. Such a shame that despite a clearly tremendous imagination and a brilliant gift for words, that you've decided that while "fat" insults are "sick", "thin" insults are acceptable. It's also a shame that given how self-reportedly anti-fat-insults you are, that you utilized classic fat stereotyping to help sell over 400 million copies of your books and in so doing helped to solidify those same fat stereotypes in an entire global generation of children. J.K., you are a big, "fat" hypocrite.